An annular eclipse is one that occurs when the moon passes between the Earth and the sun at a point in the moon’s orbit when it is far from the Earth and thus appears relatively small – the exact opposite of the effect seen in the recent “supermoon.” In an annular eclipse, this small moon appears superimposed in front of the sun rather than completely blocking it out. The visible portions of the sun form a fiery ring around the moon’s black silhouette. The moon’s shadow will fall across a large swath of the Earth, but the full annular effect will be visible only in a narrow band that goes through nearly all of Japan’s major cities (what luck!) on Monday morning before moving out to sea in a long arc across the northern Pacific Ocean, during which it will cross the International Date Line to jump back to late Sunday before coming ashore in northern California, passing over Las Vegas and the Grand Canyon, and finally fading out around New Mexico’s border with Texas. The National Astronomical Observatory of Japan has an excellent English-language map you can use to plan your eclipse-viewing HERE, with peak times for nine Japanese cities listed. And you can find a map from NASA, showing a worldwide view of the eclipse area, HERE. A warning that bears repeating is that if you look directly at the sun, even during an eclipse, you can seriously injure your eyes. And that is why eclipse-viewing glasses like the ones I bought at Bic Camera in Yurakucho, Tokyo, are now on sale all over Japan. These are no ordinary sunglasses. They are so dark that if you put them on and look anywhere BUT directly at the sun, you won’t be able to see a thing. But you can see a clearer and more detailed image of the sun than you would ever be able to get with your naked eye. 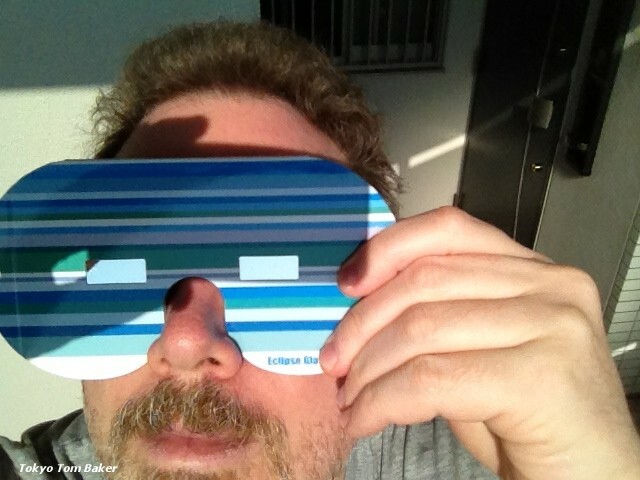 This morning, looking at a normal sun, I found that the eclipse glasses work best in combination with the ordinary eyeglasses I usually wear to look at distant objects. There are a couple of different brands available. I picked Vixen because it was the most expensive (1,480 yen, or about 19 dollars) and I had few other data on which to base my choice. Therefore, I was a little annoyed to open the package and find that the glasses have holes on either side for a piece of string to keep them on your head – but no string was included. You’d think that customers who pay the highest price could at least get a piece of string thrown in. On the bright side, I’ll get to use these glasses more than once. 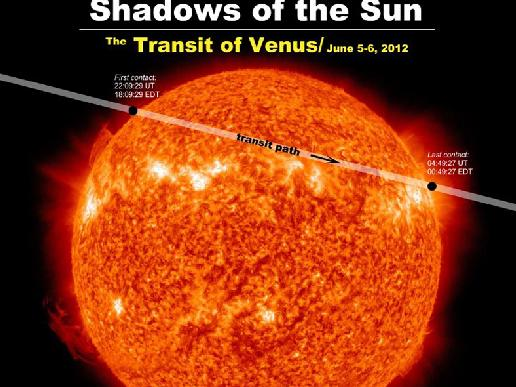 Early next month, Japan will also be in the optimal viewing area for the transit of Venus, an event in which the planet Venus passes between us and the sun. 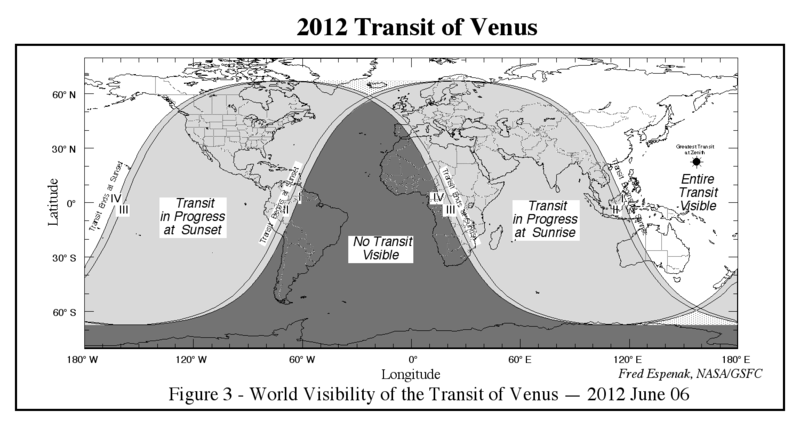 Even if you don’t live in Japan, the transit of Venus will be fully or partially visible across most of the world, including parts of Africa, parts of South America, all of Australia and nearly all of the northern hemisphere. Watch carefully, and enjoy the show. You are currently browsing the Tokyo Tom Baker: The Blog blog archives for May, 2012.